You were quickly whisked away, but you did it on your terms so that makes it ok. You will always be loved dearly and remain in our hearts forever. 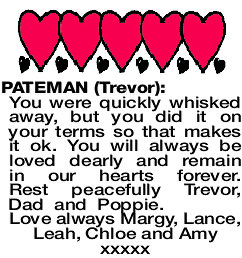 Rest peacefully Trevor, Dad and Poppie. The Funeral Service for Mr Trevor Pateman of Thornlie will take place in our Chapel, 312 South Street, Hilton commencing at 10.00am on THURSDAY (11.04.2019). 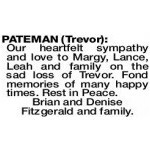 PATEMAN TREVOR Our heartfelt sympathy and love to Margy, Lance, Leah and family on the sad loss of Trevor. Fond memories of many happy times. Rest in Peace. Brian and Denise Fitzgerald and family. 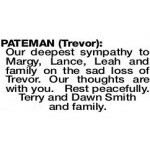 Our deepest sympathy to Margy, Lance, Leah and family on the sad loss of Trevor. Our thoughts are with you. Rest peacefully. Terry and Dawn Smith and family.